The good news is that because thermal spray processes can work with a very wide spectrum of materials, different types of wear and abrasion resistant coatings can be used to combat any type of wear problems. Tungsten carbide is one of the most wear resistant materials which can be applied via the plasma spray or HVOF processes. Tungsten carbide coatings can achieve a hardness approaching or exceeding 70RC. Additionally, tungsten carbide can be ground and polished to a mirror finish, making it a great replacement for hard chrome plating. The anti-galling and self-mating chrome oxide ceramic coatings are recommended for their excellent wear resistance to particle erosion, cavitation, hard surfaces and abrasive grains at all temperatures below 540C. Coatings of this material are insoluble in acids, alkalis and alcohol. When properly sealed, they are recommended for use in corrosive chemical environments in temperatures up to 175-200C. This material is recommended for use when corrosion or chemical attack is an additional concern. Aluminum oxide ceramic or sometimes referred to as “White Alumina” produces dense coatings which resist wear by fibers and threads, and also resist erosion in high temperatures. This material is very useful as a thermal barrier and when sealed, it is used for electrical resistance in high temperatures. Wear and abrasion resistant coatings can help industrial equipment and parts perform more efficiently and last longer. This will help to also lower parts and equipment replacement costs and make lives easier for the maintenance personnel. When you use thermal spray to achieve abrasion and wear resistance, you can also benefit from enhanced harness and increased ductility. What this means is that you will then be able to avoid situations such as micro-cracking or increased surface fatigue. Due to the unique difficulties posed by wear and abrasion, A&A Coatings has developed many different types of coatings to solve specific and unique problems. Our engineering department will assist you with expert recommendations to solve your problems by utilizing the coatings mentioned earlier or one of the hundreds of other coatings we offer. 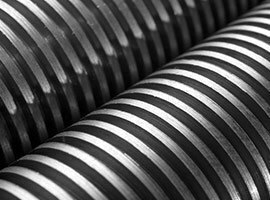 Call us today to discuss your wear and abrasion resistance needs!